The teachers of Virginia, members of the Virginia Education Association, are eager to welcome you to the profession. We know that you are working hard to complete your degree, and we want to help. That's why we support the Student Virginia Education Association (SVEA), a pre-professional organization that will guide you into our challenging world of teaching. Joining Student VEA opens doors to you with our local associations in every school division in Virginia. Those local associations are professional communities that will give you support and guidance during your student teaching. And when you land your first teaching job, VEA's local associations will help you throughout your career -- especially during your early years as a new teacher. 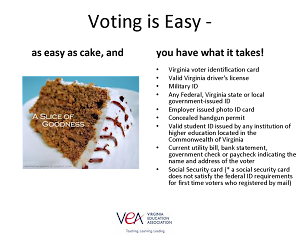 Student membership is available if you are enrolled in a post-secondary program that is preparatory for employment in a position that will make you eligible for Active (teacher) membership in the VEA-NEA. Student membership is available to those who are NOT currently under contract with a school division in Virginia. As a student member of VEA-NEA, you'll have the nation's largest education association (3.2 million members) working to provide you with tools and resources for a successful career. Annual dues are $30, plus your local chapter dues. Why so low? Because VEA-NEA members supplement the cost of the program to help you along your path to teaching. I don't live in the same state as my college/university. Which state should I join? You join the state where you are enrolled as a college student (i.e., if you live in West Virginia, but attend school in Virginia, you become a Virginia member). Am I covered by liability insurance as soon as I sign up online? Check with your local chapter president for a membership form, or click here to join online.